New Delhi : All India Radio accorded its first official recognition to releaseMyAd, India’s largest online ad platform as its only virtual advertising agency authorized to accept & process radio advertisement bookings for its network of stations, which include Akashvani, Vividh Bharati, FM Rainbow & FM Gold. As one of the country’s foremost welfare awareness medium All India Radio enjoys a far wider reach across the country than far surpasses that of any other private FM station. As an online platform that creates advertising opportunities for small and medium businesses in radio,cinema and print segments across India, releaseMyAd’s partnership with AIR could not have been a more compatible one. 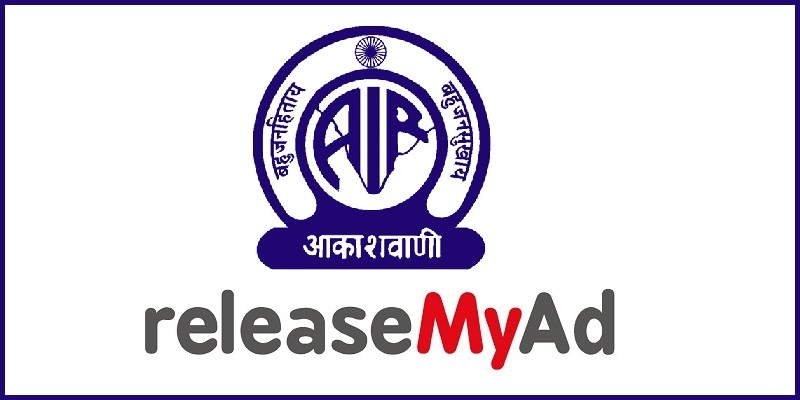 To reinforce its presence in the virtual world, in a pioneer move, All India Radio engages online advertising company releaseMyAd.com to meet twin objectives of optimum inventory utilization as well as revenue augmentation. The facility allows advertisers to book ads online across all channels of AIR with a simple mouse-click. As an online media option, releaseMyAd makes mass media advertising options accessible to all by effectively matchmaking between media owners and advertisers. “AIR has complete national reach from the main urban centres to the tier 3 cities and even the most far flung rural sections of the country with its three tier broadcasting system. With its concept of local radio constituting the third tier of broadcasting, there are stations in all district headquarter towns. However, accessing businesses in the farthest corners who could utilize the radio for advertisements becomes very difficult for AIR. Moreover, given their location, the business owners too don’t end up reaching out to the relevant sources for the purpose. “Even seasoned advertisers who want to advertise on AIR are not too sure about how to reach out to them. It is not possible for Prasar Bharati to set up offices in every nook and corner of its broadcast boundaries. ReleaseMyAd will now do the needful to bridge this huge gap between businessmen and their remotely situated target groups”, added Lunia. As the largest public service broadcasting network in the world, this provider of news, music and spoken word programmes in 26 languages and 146 dialects covering practically every corner of India, All India Radio is bound to make brand reach much easier for companies throughout. At a time when the country is riding a huge startup tide that is slowly transforming the country, this move on the All India Radio’s part will help the new wave of enterprises effectively reach out to audiences in every nook and corner of India when the tech transformation that is engulfing the big cities starts making its presence felt in the interiors too. ReleaseMyAd is a multi vertical advertising platform functioning in the newspaper, magazine, radio and cinema segments. It has created an online marketplace for media owners and buyers, to discover & transact with each other effectively. It serves over 100,000 advertisers annually, with its spectrum of clients encompassing SMB’s, corporates, startups & individuals. Its clients include Craftsvilla, Swiggy, PepperTap, Housejoy, TaskBob, DoorMint and LocalOye.